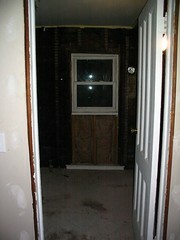 Fixer-Upper » The demo is done, man. The demo is done, man. We just finished up the type of work weekend you can only pull off a few times a year….. one where you get more accomplished in two days than you usually do in two months. And even though my lungs are full of drywall dust (despite the safety gear), my snot looks like dirt, and my muscles are screaming from all the odd things I made them do, I’m feeling all sorts of revved up because we made a HUGE dent in our master bathroom. The demo is done! This is no small feat when you consider that we actually had to gut 1.5 rooms down to the studs – the bathroom AND a portion of the craft room next to it. 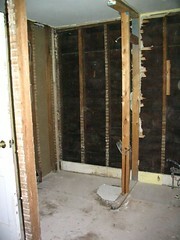 We blew out a section of wall between the two rooms so we can have a bigger bathroom. The north side of the craft room was a small kitchen when the house was a two family. 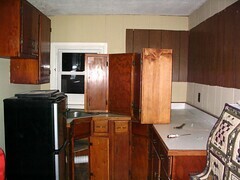 So in addition to removing a bathroom vanity, tub, toilet and two wall sections we also had to remove a whole bunch of kitchen cabinets and nasty linoleum. We got everything into the dumpster by chucking it through the stairwell window – including the tub! 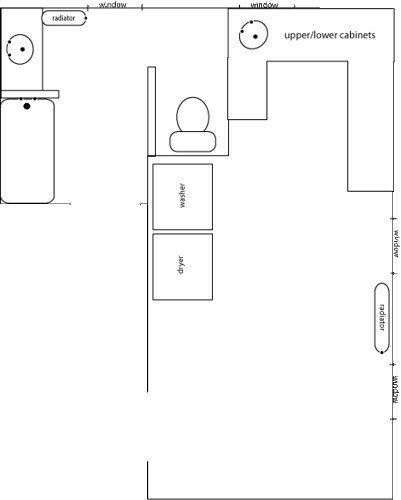 Our plan, illustrated somewhat roughly in diagrams below, is to bump one side of the bathroom out about 3 feet. We’re going from 8×10 to 8×13. 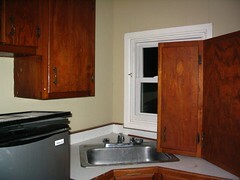 The craft room, which acted as a kitchen/dining area when the house was a two family, had room to spare – it was 10×21. So it will lose 7 feet in the back – but 3 feet of that will become a closet. A closet I cannot wait to fill! 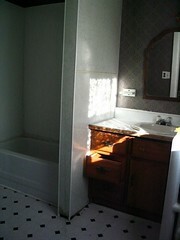 Here’s the bathroom, before and after demo – click on the thumbnails for bigger pics. 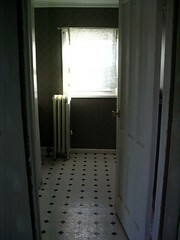 And here’s the craft room, before and after demo – click on the thumbnails for bigger pics. 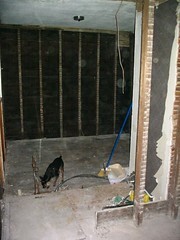 The picture on the right (the one with Nero sniffing around) is taken from the bathroom, looking through the new hole in the wall into what used to be the craft-room-kitchen area. Now that everything is out, we have a clean slate. We took the lathe out so that we could put up insulation. This is the north end of the house, so it should be very beneficial to have something in the walls besides mice! You two really are amazing. We played video games and ate ice cream this weekend. I wish I had an ounce of your productivity! What an perfect plan! 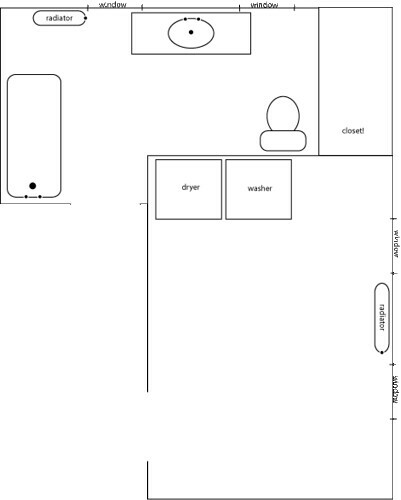 I love floorplans, don’t you? Now, where’s my graph paper? I need graph paper! 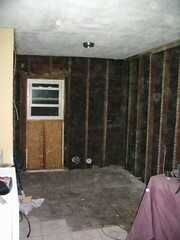 Of course, I will die of disappointment if you guys finish your master bathroom, while ours is still an empty shell.